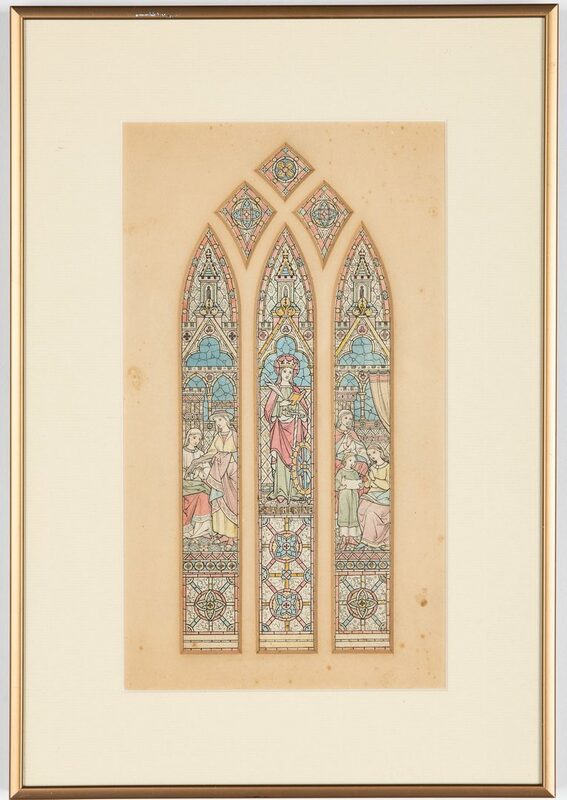 Two (2) framed watercolor studies for arched Gothic stained glass windows, attributed to Frank Tenney Johnson or Karl Reimann (also known as Carl or Charles Reimann). 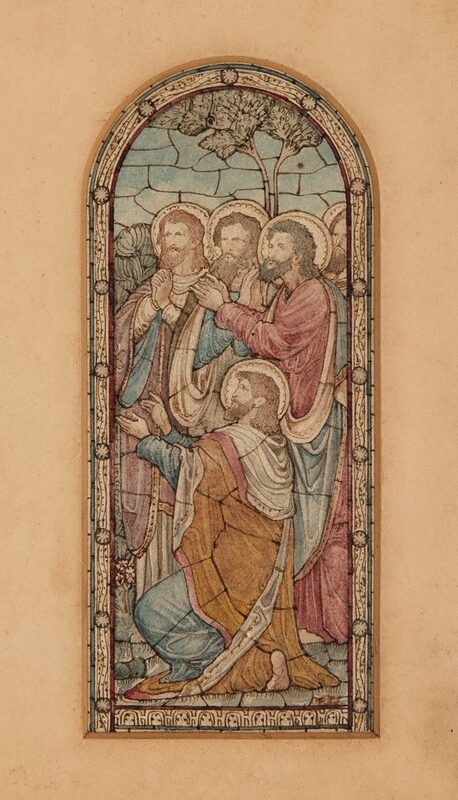 1st item: Design for a triple window depicting the ascension of Jesus Christ, with eleven disciples. 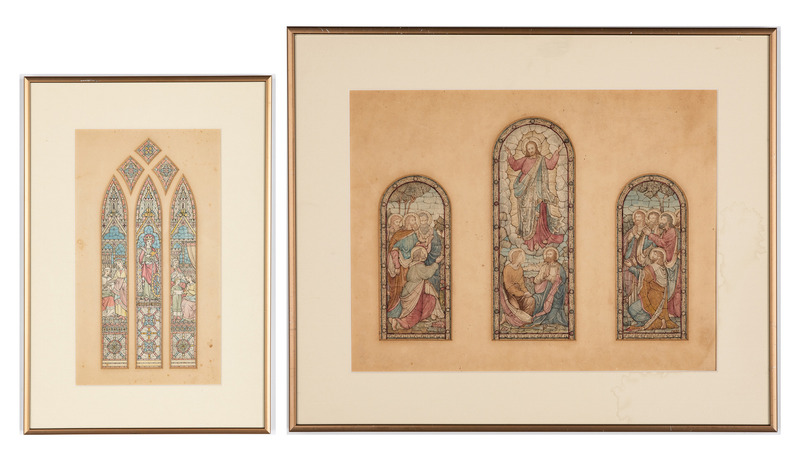 7 1/2" x 2 3/4" and 5 3/14" x 2 1/2", all matted and framed together in a later rose gold metal frame, 14 1/4" x 17 1/4". 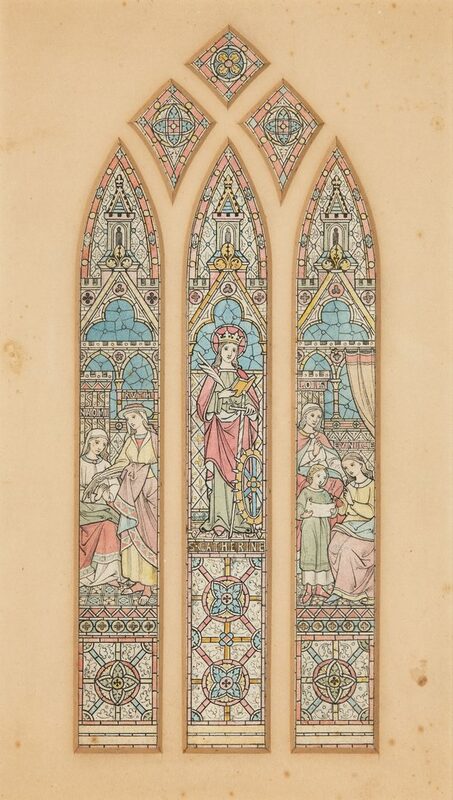 2nd item: Design for a large stained glass single window depicting St. Catherine. Image – 9 1/2" x 3 3/4", framed – 15" x 10 1/2". 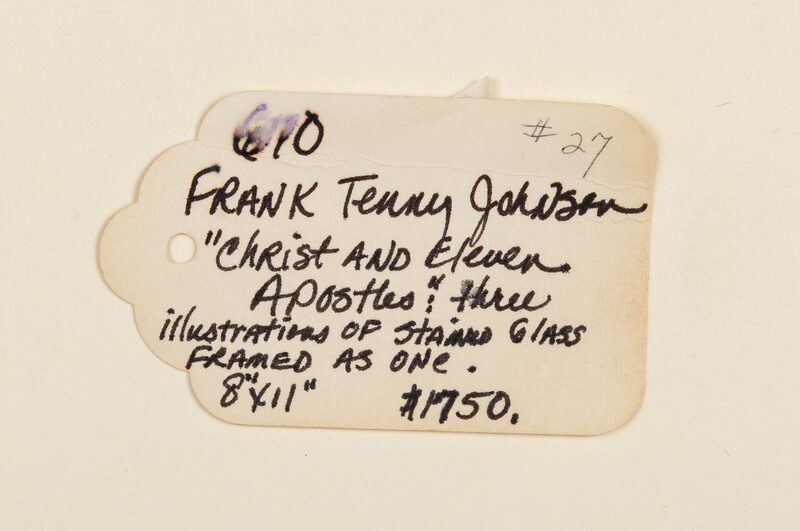 Provenance: Estate of Larry Casey, Jackson, TN, purchased from Fowler's Period Gallery, Scottsdale Arizona. Biography: Charles A. F. Reimann (Karl Reimann) was born in Milwaukee, Wisconsin on March 13, 1873. Reimann was a student of Richard Lorenz (February 9, 1858- August 2, 1915) a successful painter of Western scenes who taught a number of students including Frank Tenney Johnson, Herman Pfeifer, Arthur Becher, and Edward Steichen. Reimann later studied with Max Thedy (1854-1924) at the Weimar Art School in Germany. 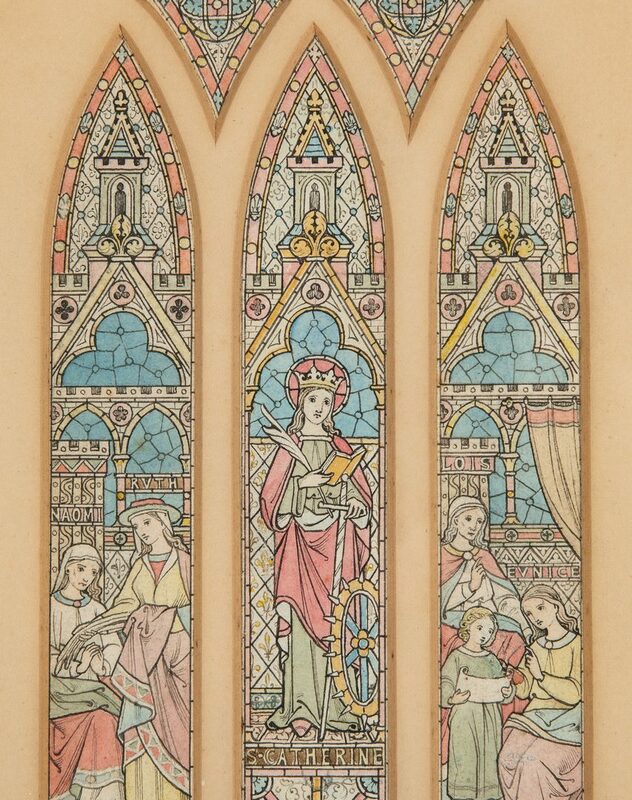 In Milwaukee Reimann had a stained glass design business, the Carl A. Reimann Company, until the Depression and is listed in "Biographical Index of Historic American Stained Glass Makers" which was complied by Robert O. Jones in conjunction with the Stained Glass Association of America (SGAA) Stained Glass School. The Biographical Index lists over 16 designers and companies that manufactured stained glass windows in Milwaukee, including the Milwaukee Mirror and Art Glass Works that may have made the stained glass windows in the St. Patrick's Catholic Church. 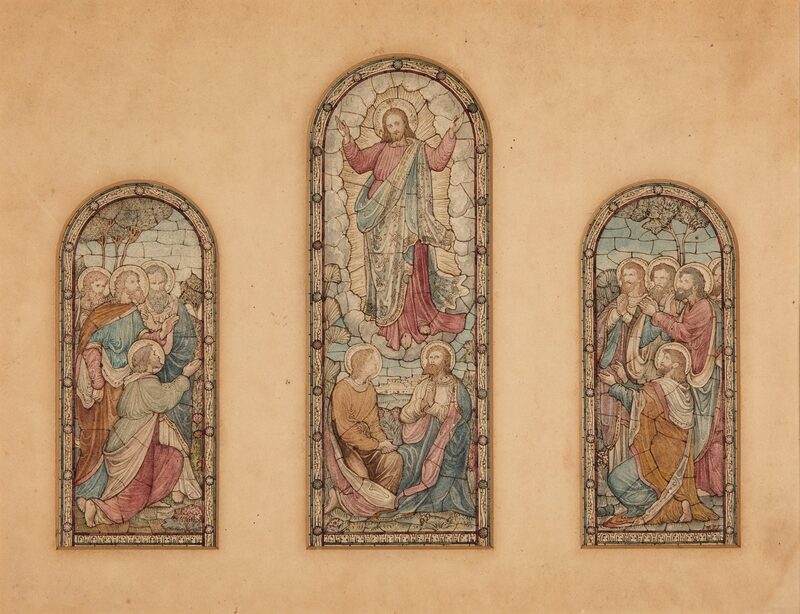 Companies such as the Enterprise Art Glass Company and Conrad Schmitt Studios are still in the business of making and restoring church stained glass windows. 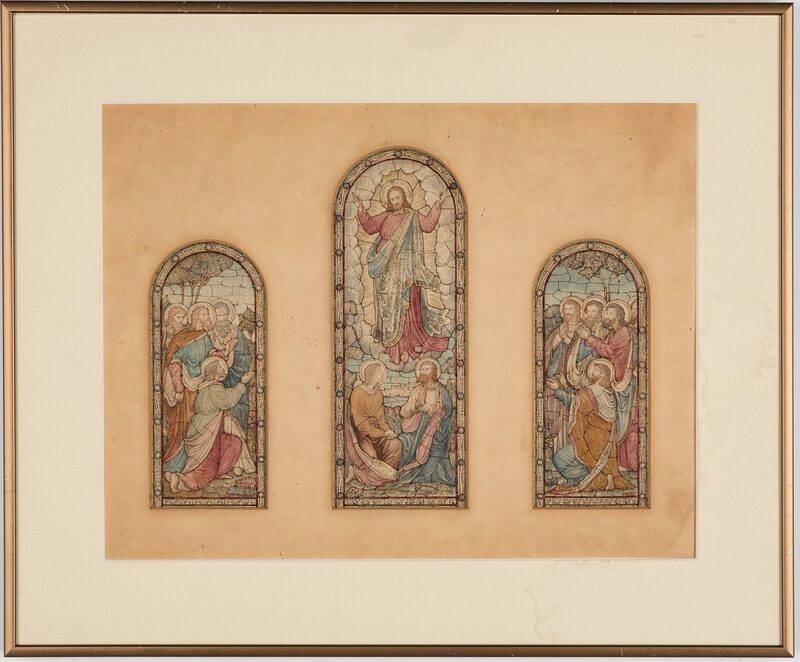 Reimann was considered a master designer of stained glass windows and is credited with designing several windows for churches in Milwaukee, West Virginia, and the Dakotas. 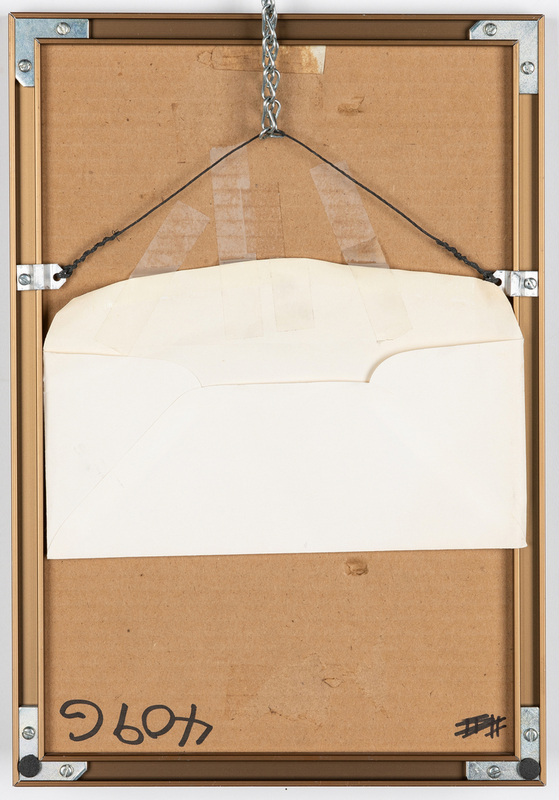 Reimann died in Milwaukee on December 17, 1937. 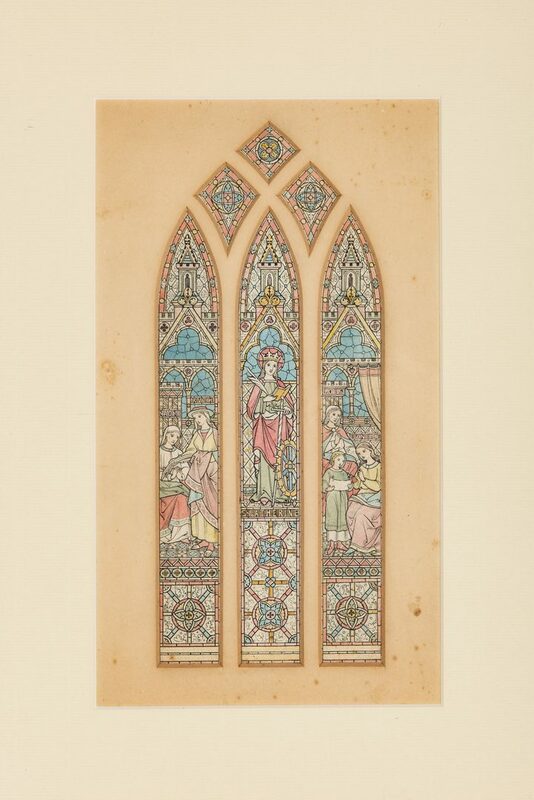 (source: Stained Glass Documentation of the St Patricks Catholic Church Wakonda, South Dakota). CONDITION: Both toned with foxing to mats, one has water staining to mat. 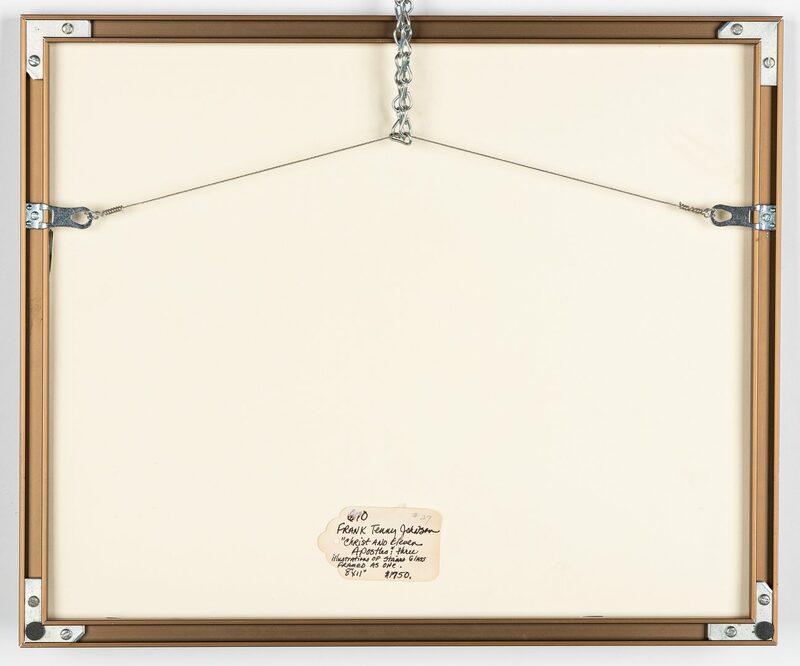 Not examined out of frames.